Michael Sam Added To Dallas Cowboys Practice Squad : The Two-Way The NFL's first openly gay player was released by the St. Louis Rams last week. Cowboys Coach Jason Garrett said the decision to add Sam to the practice roster "is about football." 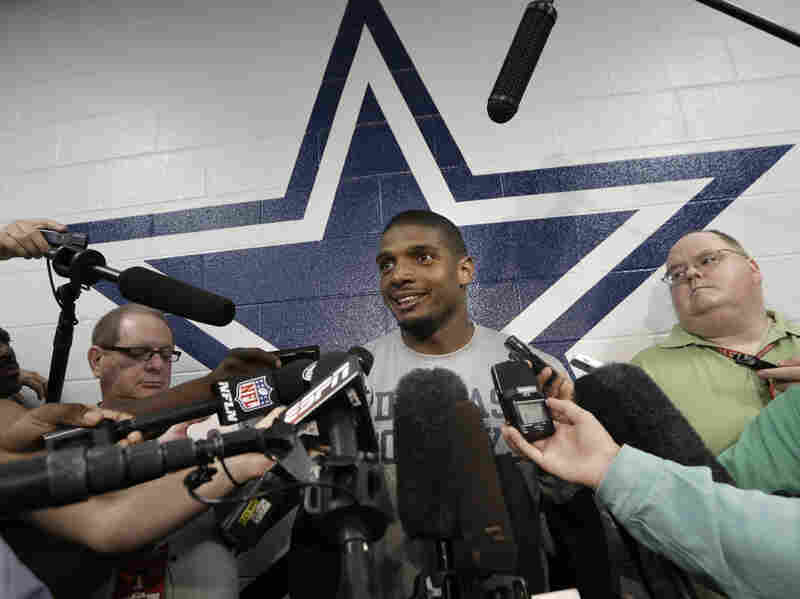 Michael Sam, a defensive end on the Dallas Cowboys practice squad, speaks to reporters at the team's headquarters on Wednesday. Michael Sam has been added to the practice squad of the Dallas Cowboys, coach Jason Garrett announced Wednesday. As we told you last week, the National Football League's first openly gay player was released by the St. Louis Rams when teams had to cut their rosters to 53 players. St. Louis picked the defensive end 249th out of 256 in the May draft. The Associated Press says the Cowboys are "seeking help with their pass rush because of injuries and the offseason release of franchise sacks leader DeMarcus Ware." The news agency added that Sam was unlikely to be on the active roster for the opener Sunday against San Francisco. "This is about football," Garrett said at a news conference. "We evaluated him as a football player and think he can help us as a football player. We want to see what he can do, but our attention and focus is on football." "Any team can sign Sam off the Cowboys' practice squad, but would have to put him on the 53-man roster for a minimum of four weeks. "Being on the Dallas roster means Sam is returning to his home state. He was a lightly regarded recruit out of Hitchcock, Texas, a town of about 7,000 along the Gulf Coast about 40 miles southeast of Houston. His first two years at [the University of] Missouri, Sam backed up Aldon Smith and Jacquies Smith, both of whom are in the NFL."